If you have been in a car crash, you may have experienced whiplash as a result of your head being forced forward, backward, and forward upon collision of the vehicle in which you were riding. Though you may not initially notice them, additional symptoms may be signs of mild traumatic brain injury. Clients often explain that weeks after a collision, they notice they have become more forgetful, can’t think as clearly, or have more difficulty focusing than they had before the crash. These are signs of mild traumatic brain injury, and they are indications that you should seek medical attention for an examination. Mild traumatic brain injury is often not visibly apparent, and insurance companies often will claim that a client is exaggerating the effects of whiplash, but you need to see a doctor for an evaluation if you are in this situation. I have worked on many of these cases, and I have the answers you need regarding concerns following injury in such an accident. Watch the video to learn more. 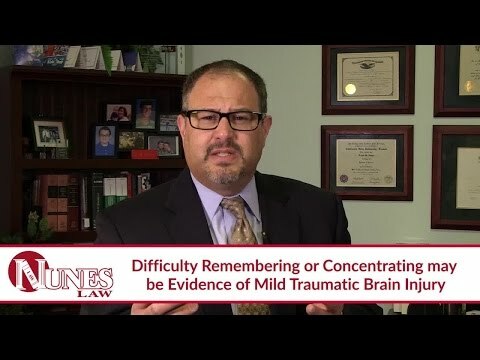 If you have additional questions regarding this mild traumatic brain injury and car accident cases, I want you to call me at (559) 436-0850. I welcome your call. Visit our educational website at https://www.nuneslaw.com for more videos and media content from our law firm.